Edward Harmston is one of the men on the Bottesford ‘church organ’ list of WW1 Servicemen. People named Harmston lived in Bottesford in the years before WW1, and so it is probable that Edward Harmston was closely related to them. Otherwise, it would be difficult to account for his being included in the list of WW1 servicemen from the village. But, there is a problem, in that he was not included in the Bottesford censuses of 1901 or 1911, and it has not been possible to find a conclusive link to show that he actually lived in the village. We must conclude that he probably did come to live in Bottesford in the time after the 1911 census. Who was Edward Harmston? It seems that his name was uncommon in the pre-WW1 years, surprisingly so (though there were many with a second Christian name, such as Edward Charles and so on). With this in mind, it seems significant that there should be a baptismal record for an Edward Harmston. This records the baptism on the 18th June 1882 at Billingborough of Edward, son of John and Sarah Ann. This Edward may also have been the man who was married on the 30th July 1906 at St Martin, Lincoln, to 22 year old Mary Ann Marshall. He may also be the man whose death took place in 1923 and was buried on the 8th March at Canwick Road Cemetery, Lincoln. Mary Ann Harmston, nee Marshall, died in 1907, the year after her marriage, and was buried on the 31st July in Canwick Road Cemetery. However, there was another Edward Harmston, born in 1884 and baptised on the 15th December at St Andrew, Lincoln, son of John and Louisa Harmston. Though it is not the writer’s opinion that this was the Edward mentioned in the Bottesford list, it remains a possibility that has to be borne in mind. In 1901, there were two families named Harmston in Bottesford. John and Sarah Harmston, both 25, lived at 40 High Street. John was a railway signal man from Helpringham, near Sleaford, Lincs, whereas Sarah came from Derbyshire. This John Harmston was the third son of Luke Harmston, a coal dealer, and Mary, who in 1881 lived on the Church Yard at Helpringham. The other family were John and Sarah Ellen Harmston, who lived at Debdale Farm Cottage, which was next to James’ farm in the fields south of Nottingham Road. John was a stockman on the farm. They had three children with them: John Frederick, a ‘farmer’s boy’ born in 1887, Jave (Jarvis), born in 1890 and Elizabeth, born in 1893. All this family had been born in Billingborough, also near Sleaford. It is not known if the two families were related. In 1911, John, Ellen and their daughter Elizabeth were living at Debdale Lodge Farm (Burrows Farm), Bottesford, and he was working as a farm labourer. The other Harmston family was no longer in the village. The association with Billingborough suggests that Edward was part of the family of John and Sarah Ellen Harmston, perhaps an elder child who left home before 1901. However, in the census of 1891 John and Ellen, living at Drain Side, Fen Road, Billingborough, had four children living at home: Thomas (born 1878), Mary A. (born 1880), John F. (born 1888) and Jarvis (born 1891). Edward was not recorded, though if he was born in 1882 he would have come between the births of Mary and John. It seem most likely that Edward Harmston was born in 1882 at Billingborough, a son of John and Sarah Ellen Harmston, and that for some reason he was separated from his parents and siblings before 1891 and did not rejoin his family until after the 1911 census. 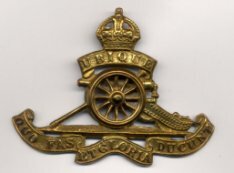 Edward Harmston served in the RFA as a Driver 41537. He entered France on the 26th August, 1915. His Medal Index Card records that he was awarded the 1915-Star, Victory Medal and British War Medal. Regrettably, we have no further details of his service record. Sara Ellen Harmston, Edward’s mother, died in 1933 at Bottesford, and was buried on the 20th February at St Mary’s, aged 78. Her burial record confirmed her full name as Sarah Ellen Harmston. His father John also died in Bottesford on the 23rd August, 1934, aged 84, and their Daughter Elizabeth died in Bottesford on the 16th February, 1926, aged only 32. All three are commemorated on a single gravestone in the northern part of the churchyard. Edward Harmston died in 1923, aged 41, and was buried on the 8th March in Canwick Road Cemetery, Lincoln. He had been living at Featherby Place, St Botolph, Lincoln. Edward of the RFA was the third child of five born at Lincoln to John Harmston and Louisa Rhodes. Why he should be remembered at Bottesford is unclear although there were occasional Harmston families who lived for some of their lives at Bottesford, presumably as a short journey from Lincolnshire where the Harmston name originates. Edward was married to Mary Ann Marshall in 1906 at Lincoln and they had one child, Mabel in 1907.